For off-roading, traction is key. You want every wheel working to drive the vehicle forward. Cherokee offers three available Jeep® Active Drive 4x4 systems that help to ensure the right tire has traction when it’s needed. Master ice, slush, and heavy snowfall without losing your cool. Jeep® Cherokee vehicles equipped with an available 4x4 system feature a Jeep® Selec-Terrain® Traction Management System with Snow Mode. Snow Mode minimizes slippage and oversteer and enhances stability, preventing wheel spin during winter conditions. 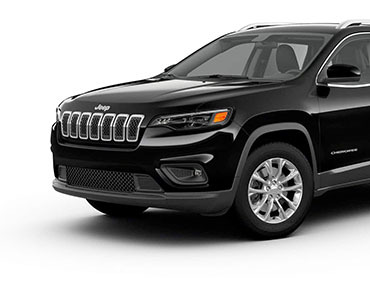 Whether you’re cruising the urban jungle or exploring the unbeaten path, every Cherokee model offers a stylish and capable variety of wheel and tire options to make every adventure a memorable one. Light up the night in style. 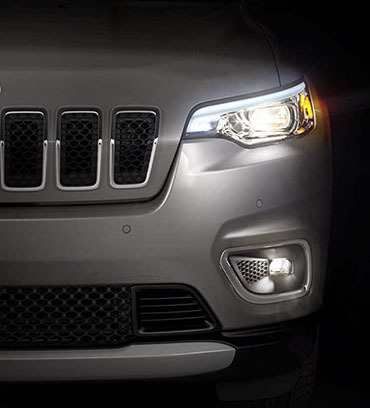 Standard premium LED Headlamps and fog lamps offer improved lighting performance for added safety and security, while wider distinctive LED Daytime Running Lamps (DRLs) sweep back like a falcon’s wings for a bold style refresh. Got your hands full? The new available hands-free power liftgate helps make loading and unloading anything from groceries to sports equipment a little bit easier. 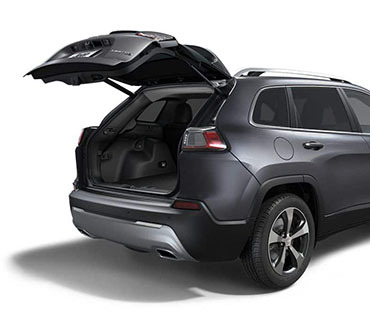 Simply hover your foot below the liftgate for quick hands-free access. SiriusXM Guardian,™makes it easier than ever to keep an eye on your vehicle from virtually anywhere. Lock your vehicle doors from your smartphone with the Uconnect® mobile app, call for assistance in an emergency with SOS Call and Roadside Assistance Call, find your vehicle in a crowded lot with Vehicle Finder and much more. High-strength steel creates a robust body structure that maximizes crash protection and optimizes vehicle dynamics and weight. Eight standard advanced airbags —including full-length side-curtain airbags and driver and front passenger knee bolster airbags —work in tandem to help provide protection to vehicle occupants. Maneuver into a parking spot easily with the standard ParkView® Rear Back Up Camera. The system displays a rearview video image with dynamic gridlines when you shift into reverse. With an on-screen alert or audible chime, ParkView will bring your attention to hidden rear objects. The available Blind Spot Monitoring system monitors the space between you and other drivers. Dual radar sensors detect when another vehicle is entering one of your blind spot zones. If a vehicle is detected, you will receive an audible chime and visual warnings on the corresponding exterior mirror.